Yesterday was the 1st year anniversary of The History Quilter Podcast and it seems impossible how fast a year can go by. My first episode took me about 10 hours to record, edit and upload but once done, I was thrilled at what I had created. Those first few episodes are pretty rusty but were great learning experiences - I guess each episode is a photo of myself taken at a different angle, each worthy of a view. Enough with the introspection....Episode 20 is now available on iTunes and Podbean. 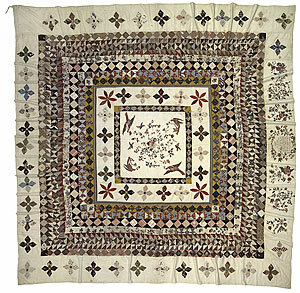 Here's a brief history of The Rajah Quilt if you're not a podcast listener: The Rajah Quilt was made by convict women whom were on board The Rajah in 1841 as it traveled from Woolwich, England to Hobart, Tasmania. A group called the British Ladies Society for Promoting the Reformation of Female Prisoners (began by Elizabeth Fry) supplied the convict women on the ship with the following provisions for their travels: tape, pins, 100 needles, four balls of white sewing cotton thread, a ball each of black, red and blue thread, black wool, 24 hanks of colored thread, a thimble (only one?) scissors and two pounds of patchwork pieces - almost 10 meters. The quilt finished at 10' x 11' and apparently the individual kinds of stitches based on the level of proficiency with sewing can be seen especially with those with blood stains due to pricked fingers. Once the ship arrived in Hobart, Tasmania the quilt was given to the the Lieutenant Governor's wife, Lady Jane Franklin but is now housed at The National Gallery of Australia in Canberra. Thank you to everyone who has been listening along this past year and I look forward to what the next year brings to The History Quilter Podcast. 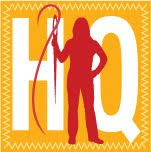 If you have any suggestions about future quilt history topics please comment or send me an email at historyquilter@gmail.com. Please come back here on Saturday to see a wrap up of the Road to California Quilt Show I will be attending tomorrow. I'm looking forward to both walking the vendor isles looking for fabric/goodies but also to see the quilts on display - the Showcase sections include Art Quilts, Traditional Quilts, Innovative Quilts, Pieced, Applique, Mixed, Other and Wearable Art and I hope to post a number of photos here with examples of each. Thanks for letting us know about episode #20 and congrats for 1 year, Susan! And thanks for introducing me to the world of quilting podcasts! And I think I have everything I need on hand to make that kale soup - thank you!! Congrats on one year podcasting! I look forward to the next year. Any leftover Tiramisu? It is too rich, but I love it. Wow, I never thought I would learn about my country's history on your podcast. Thank you. Congratulations of 12 months of podcasting. I had a chance to listen to #20 this afternoon. How amazing, yes? A whole year of podcasting. Thanks for such hard work and the info on the Rajah quilt was so interesting. I was in London in 2009 but just for a few days and I wished I had seen this quilt then. Maybe someday...a trip to Australia!